Discussion in 'Salamanders Discussion' started by Itepixcauh, Mar 31, 2016. Concept wise what is a Rhinosaur? Reaper has a huge chunk of metal in their Reptus army called a Krung Beast. 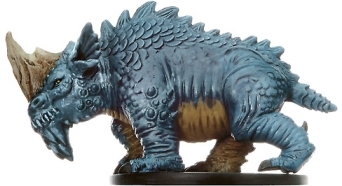 It fits diagonally on a 51x51mm base and is mammalian (cross a bison and a water buffalo, but meaner). I think concept wise the Rhinosaur is a larger Kaisenor and I would use a GW carnosaur for size, the metal version not the plastic one. And Kaisenor is Cold One/Horned One by another name. Been discovering that rhinosaurus is a bit of an Internet meme. A WotC pre-painted plastic. If I remember correctly, they are perma-stuck to 2 inch rounds. @ Crowsfoot: Any chance you could you take a front-on shot of the model please? Although the profile is rhino-like chunky, the width looked quite thin on the 360° video on the Gamezone website. Np will do it tonight for you, want a GW coldone side by side? From the way I keep imaging it, my take is that it's a rhinoceros-like dinosaur - broad, stout and muscular, with a big head and a walking on all fours. There really isn't much of a description so it'll be interesting what Mantic come out with if they ever do make the models for it! If you wanted to be pedantic you could always look at the etymological descriptors. My girlfriend informs me that rhinoceros comes from the Greek 'rhis' (rhin-) meaning 'nose' and 'keras' meaning 'horn'. 'Sauros' was the Greek for 'lizard', so a Rhinosaur should either be a lizard with a distinctive nose, or an animal that's defining feature is a lizard-like nose (which would imply it's not a lizard as then a lizard-like nose wouldn't be distinctive. Because it's a lizard). I'm thinking they could work. That is another thought I had: put two Cold Ones side-by-side connected by a small howdah to represent a Rhinosaur (there would be one lizard in the howdah). That would be grand if you could please, thank you! This is exactly how I see them! Does anyone know if there are any models similar to this available from any model companies at the moment? Google either Centrosaurus or Rubeosaurus. To be fair it could be any dinosaur in the Centrosaurinae family! That look indeed really good. I'm amazed! Thank you, it's appreciated! So about the same thickness, maybe a *tiny* bit wider? @Crowsfoot - is the max thickness at the rider's knees? Nice pic, in any case the gamezone mount is clearly bigger than the cold one, but not so much bigger that it look like a monster, so perfect for a large cavalry. About the D&D miniatures model, those use a soft plastic that is easy to cut, I already removed the base from a few of them with a sharp hobby knife, I even got to remove the bases under the small feets or humanoid models without problem, and if you do it well you even get the base left in case you need a round one for some other project or game. Jack Trowell and Itepixcauh like this.